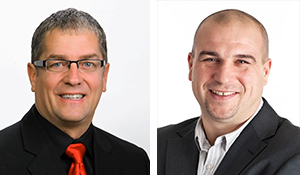 We are pleased to announce that Royal LePage Atlantic Homestead broker-owner Craig Blanchard and his partner Nick Vinicombe have opened a second office in St. John’s, effective July 1. Craig and Nick acquired Royal LePage Atlantic Homestead in December 2009, which at the time, had 14 salespeople. Since then, the agent count has more than doubled. Craig and Nick expect that recruiting and growth will continue in light of their newest location. Craig received his REALTORS® licence more than 17 years ago. He is active at his local board level, serving as past president and a member of the board of directors for the past 10 years. Craig currently co-chairs the ethics committee and serves on a number of task forces. Nick is an experienced REALTOR® with more than 20 years with Royal LePage. ← The Fine Print July/August 2014 issue is out! Congratulations!! Great Team, great Energy! !